The ABC Television Network will launch an exciting 2018-19 season with a slate of returning hit shows and several new series, beginning with the premiere of the 27th installment of Dancing with the Stars on Monday, Sept. 24 from 8-10pm, immediately followed by the highly anticipated season premiere of last year's No. 1 new drama, The Good Doctor at 10. This fall's new dramas A Million Little Things, which is about a group of friends coping with an unexpected loss, premieres Wednesday, Sept. 26 at 10pm; and The Rookie, starring Nathan Fillion as one of the newest - and oldest - police trainees in Los Angeles, premieres Tuesday, Oct. 16 at 10pm. That same night, ABC will launch two new comedies - The Conners, a spinoff of the groundbreaking show Roseanne at 8, and The Kids Are Alright at 8:30, inspired by creator Tim Doyle's Irish-Catholic upbringing in the turbulent '70s. Single Parents, which is about a group of adults who lean on each other to raise their children while trying to hold on to their personal lives, rounds out the new comedy slate, and premieres Wednesday, Sept. 26 at 9:30pm. Dancing with the Stars: Juniors, which will pair celebrity kids with professional junior ballroom dancers, launches with a two-hour premiere on Sunday, Oct. 7 from 8-10pm. Rounding out the roster of new fall titles is The Alec Baldwin Show, featuring in-depth conversations with some of today's most intriguing personalities. Starring the three-time Emmy(R) winner, the hour-long show, which first aired as a sneak preview last March, will premiere Sunday, Oct. 14 at 10pm. Friday nights herald the return of TGIF on ABC, which first launched the iconic programming block nearly 30 years ago. The new TGIF premieres Oct. 5 and will feature Fresh Off the Boat at 8 and Speechless at 8:30pm on their new night, followed by Child Support with Ricky Gervais and Fred Savage, at its new time at 9pm. Shark Tank celebrates its 200th episode and 10th season premiere on Sunday, Oct. 7 at 10pm, before moving to its regular timeslot the following Sunday, Oct. 14 at 9pm. ABC's longest-running prime-time drama series, Grey's Anatomy, kicks off its record-breaking 15th season with a two-hour premiere on Thursday, Sept. 27 from 8-10pm, followed by the fifth season premiere of How to Get Away with Murder at 10. Station 19 returns to the TGIT lineup the following Thursday, Oct. 4 at 9pm. American Housewife returns Wednesday, Sept. 26, at a new time at 8:30. Fan favorites America's Funniest Home Videos, black-ish, The Goldbergs, Modern Family and Splitting Up Together complete the fall lineup. TBS comedy Wrecked premieres its third season on Tuesday, August 7 at 10 p.m. (ET/PT). This season, the Wrecked gang find themselves shipwrecked on a mysterious billionaire's private island where they're forced to hunt each other to the death in a basic-cable battle royale. Last season, pirates invaded the island. This was bad news for Danny, Owen and the other stranded airline passengers, who've only recently recovered from the loss of wi-fi, indoor plumbing and Steve's attempted takeover of the island. 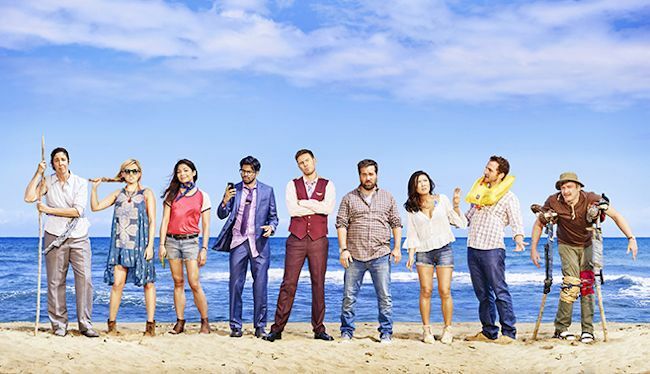 Season three stars Ally Maki, Asif Ali, Brian Sacca, Brooke Dillman, Jessica Lowe, Rhys Darby, Will Greenberg, and Zach Cregger, along with guest stars Rob Corddry, Eugene Cordero, Jonno Roberts, Karan Soni, Rachel House, Robert Baker, and Will Hines.